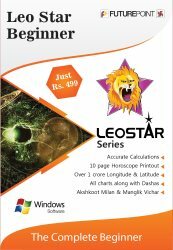 Leostar Beginner software is specially designed to begin exploring some of the most astrological calculations, system & charts. This jyotish software is most affordable & dependable basic astrology & horoscope matching software available today for astrologers and that is why it is recognised as best horoscope software in basic category. Comprehensive astrological calculations of this Jyotish software include - Avakhada, Ghatchakra, Tara Chakra, Panchang, Calendar and Kundli Milan. The features that one gets in jyotish software Leostar Beginner package are basic horoscope and basic kundli milan. Jyotish Software Leostar Beginner can cast some important basic Vedic charts like Lagna, Chalit. This jyotish software supports all Astrological Systems. All types of astrology tables required by astrologers are incorporated in Leostar Beginner. *It runs Demo for other packages like Astrology, Lal Kitab, Varshphal, Horary & KP, Numerology, Muhurat, Panchang. Astrological calculations of Leostar Beginner include - Teva - Lagna Charts, Sun Charts, Moon Chart, 16 Varga Charts, Planet Degrees/House, Avakhada, Ghatchakra, Tara Chakra, Panchang & Calendar. Jyotish Software Leostar Beginner can cast all types of Vedic charts like Lagna, Chalit, Bhava cusp and Shadvarga (6 divisional charts) Saptavarga (7 divisional charts), Shodash Vargas (16 divisional charts). Facility of horoscope matching (Kundli Milan) on the basis of Ashtakoota Guna Matching and Manglik dosh compatibility. All types of astrology tables required by astrologers are incorporated in Leostar. Various books on astrology, Vastu, Palmistry and Numerology. 21 system of Horary to get instant answer to your query. Printing facility of upto 10 pages included. Longitudes/Latitudes- Coordinate database of over 1 crore cities. Choice of Indian calendar & Ghatipal for birth detail entry. Note: A lot of features in this package are only for viewing and most of them can not be printed. Although a good basic 10 page report is available for Printing.